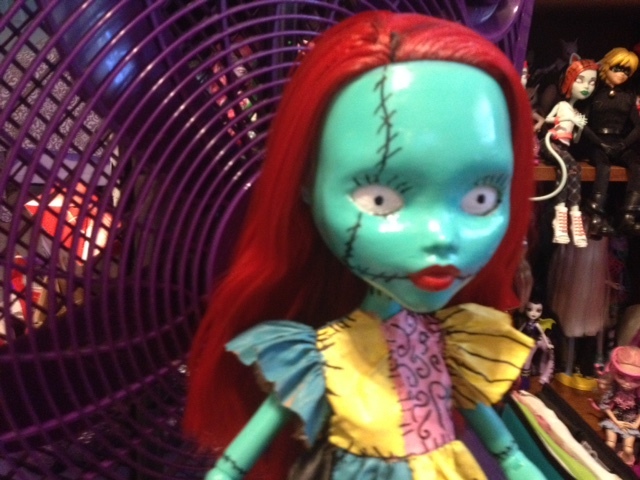 She is on display at our local Vintage toyshop and is for sale if you might be interested pm me. 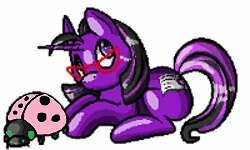 My biggest Custom I have ever tried to do. I am pretty proud of her. 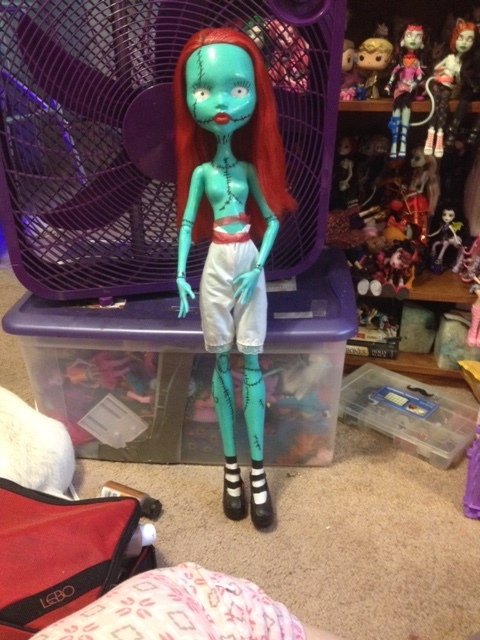 I work on this doll on and off for a long time. I had plan to do her when I 1st got this girl. 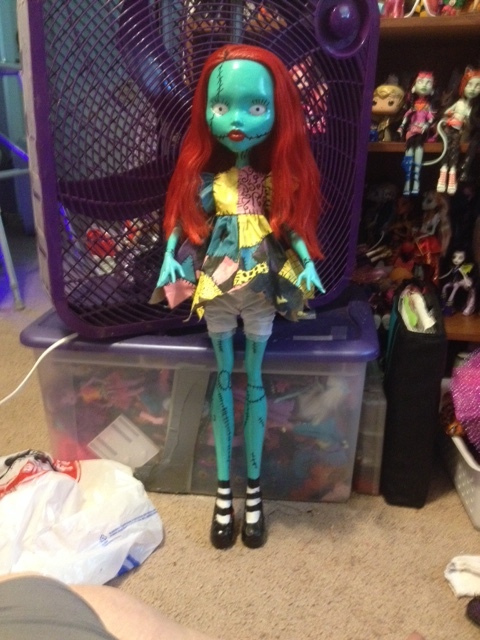 She is made from a Monster High Gore-geous Ghoul Beast Freaky Friend and is 28' tall. 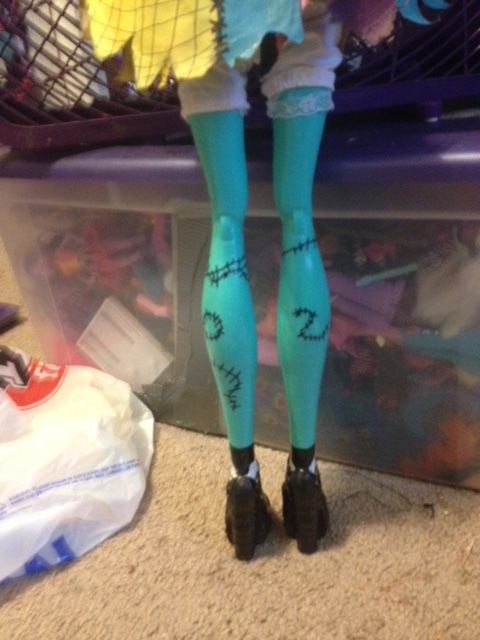 Her shoes do not come off so I had to paint on the socks and then paint the shoes the right color. She had black and blue hair mixed wit the red. I had to carefully cut all of it out while not cutting the red out. She was covered in layers of the worst glue I have ever tried to get off anything. I spent forever just getting the glue off her face. 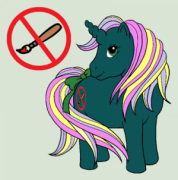 I had to glue her eyes from rotating. 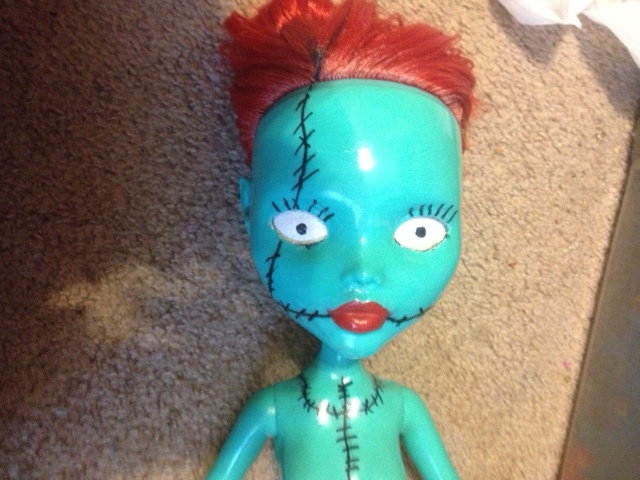 The doll has a button the changes the eyes to different color or shape. Getting the paint off was really fun. Her body I just clean really well the glue was not worth the fight. 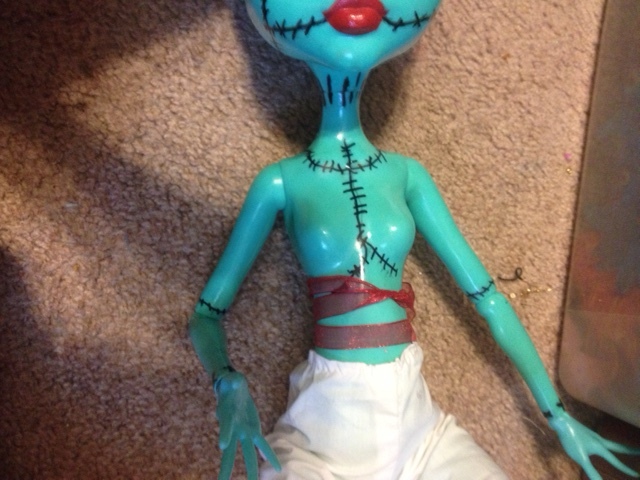 Her stiches were base on both the character proper stiches as in the movie and a few I put in to add to the dolls look. They were sealed as well after they were gone over with black sharpie and allowed to dry. Her dress was fashion from a old porcelain dolls dress and bloomers I saved. It was yellow and long. 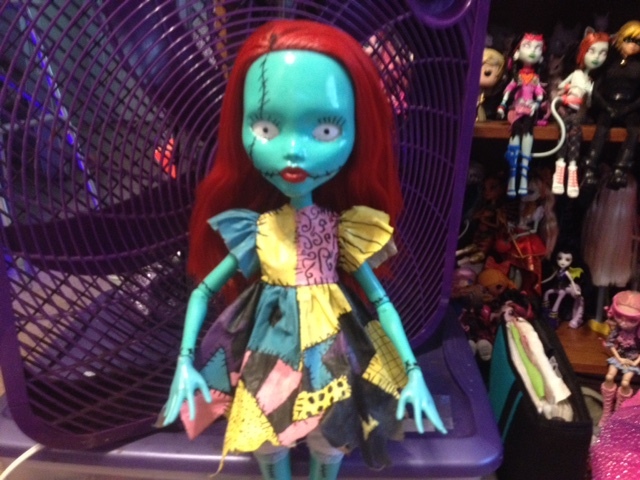 I had to cut it to length and I did the baby doll style based on her movie dress, some random fan art and cosplay dresses ( mostly for back ideas), and some of the more shorter Sally costume only the brave wear on Halloween. I cut the bottom and the sleeves I repaired the front from a few rips. 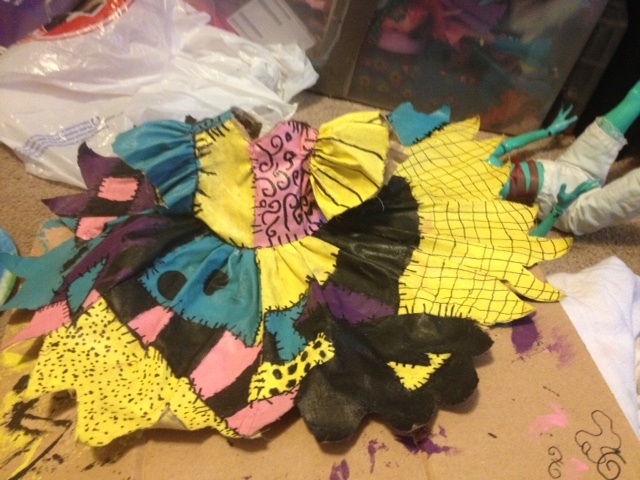 I premix a tan acrylic color and colored the dress to cover the yellow and flowers of the old dress. It also stiffen the dress making it easier to draw on. 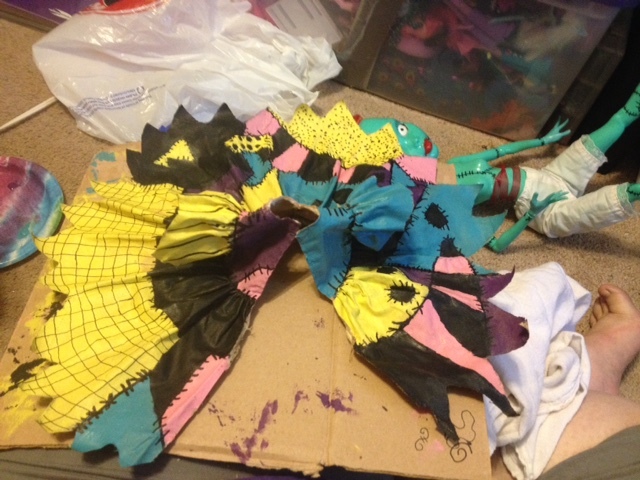 I then drew out the pattern of the dress and went over it with sharpie marker to see it better. I painted each section with a few coats to stand out. Once done I had to remark the lines and do the fake stiches on the clothing. 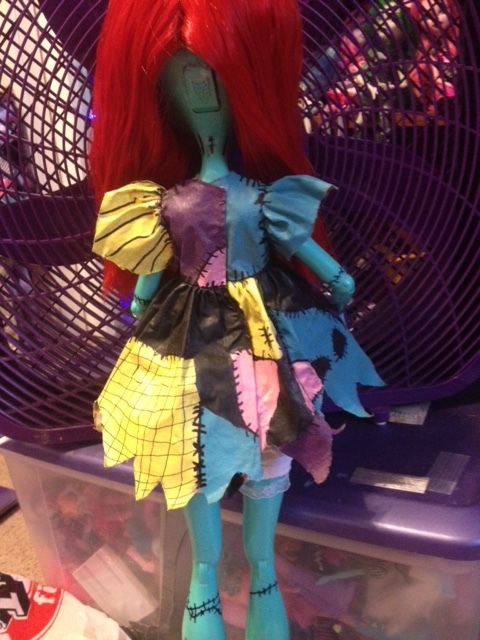 I was going to sew her stiches on her dress but the dress was too stiff by then. 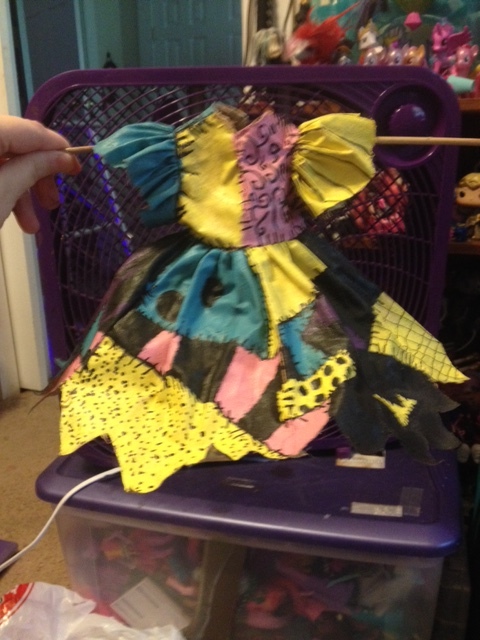 So after I did that I seal it with mod podge and left it to dry on a large Barbie hanger over night. The dress is super glued at the back but not onto the skin of the doll. There was no other way to close it. She also were a pair of bloomers that are old and ripped a bit. These are sewed on and can be either rolled up for a more normal underwear look or lowered for the longer bloomer over a baby doll dress look. The Face was pretty easy. I painted the eyes with a few layers of white did black dots and eye lashes. I had to go over the lips with several coats of red. I seal it well and it turn out pretty good. She looks fabulous! I really like her dress, I was wondering how you did that!